Today over at Architect magazine, I write about the convoluted and still unresolved saga of the Morris A. Mechanic Theatre, an important Brutalist structure designed by John M. Johansen. A member of the Harvard Five (along with Marcel Breuer, Philip Johnson, Eliot Noyes, and Landis Gores), Johansen was a protege of Walter Gropius who married Gropius’ daughter, Ati. The Mechanic, with its blocky concrete piers, inspires both derision and affection among locals. But its architectural significance is beyond doubt. Five years ago, Baltimore’s historic preservation commission deemed it worthy of landmarking–only for the landmark designation to be denied, unusually, by the city’s planning commission. Their rationale was that the redevelopment plan at the time would preserve and reuse 80 to 90 percent of the building’s shell. Landmarking would have been moot, and could have hindered the execution of that plan. Of course, the economy has changed in the intervening years, and this high-minded plan gave way to one that will deliver better ROI, replacing the theater entirely with apartments and retail. The developer recently filed a demolition permit–effectively exploiting the landmarking loophole that was brokered back in 2008. Detractors say the theater is obsolete and resistant to reuse. Whether or not that’s true, the push to demolish seems hasty and a bit underhanded, given that the theater should have been protected in 2007, but the developer was given a special pass. The city’s preservation commission has now re-initiated the landmarking process, but that depends on further approvals by the planning commission (the former naysayers) and the city council. I wonder: how many more years before Brutalism comes back into fashion, as Mid-Century modern did about a decade ago? 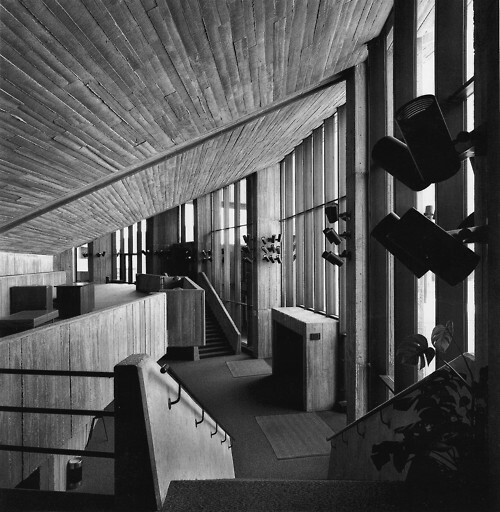 With several buildings by Johansen and Paul Rudolph under threat, much of their legacy could disappear just as people start to miss it.